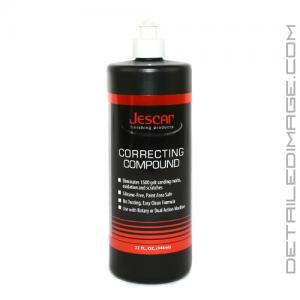 If you have heavy imperfections in your paint, the Jescar Correction Compound will help you remove them with ease. Marring, hazing, swirls marks, light scratches etc. are really no match. The high quality formula will eliminate P1500 grit sanding marks on fresh paint and deeper imperfections and oxidation on weathered paint. You can use this compound on soft, medium, hard paint types, along with fiberglass gelcoats. It is silicone free and body shop safe! When polishing, apply 3 to 4 pea size drops to your polishing pad and work with one panel at a time. Using only medium pressure, you will be amazed at how fast you can remove severe defects and leave behind a more optically clear surface. Although this compound does finish down great, there is always a chance that some compounding haze will be visible, especially when working on darker colored paint. If you are looking for perfection, we recommend following up your compounding step, with the Jescar Micro Finishing Polish. This will help finish the paint down to perfection and really turn the heads of anyone catching a glimpse of your ride! Pick up a bottle of the Jescar Correction Compound and make ugly heavy imperfections a thing of the past! Machine polishing compound developed using an advanced formula for elimination of minimum P1500 grit sanding marks on fresh paint, and deep scratches and oxidation on weathered paint. Suitable for all paint systems and fiberglass gelcoat. Can be used with wool or foam pads on either a rotary or dual action polishing machine. Silicon-free and safe for all paint areas. Shake before using. Avoid working on hot surfaces or in direct sunlight for best results. Apply 3 to 4 pea size drops of Correcting Compound over the surface of the polishing pad and work in 2' x 2' area using medium pressure and speed (1200-1800 rpm) until all of the defects have been removed. Clean area with a microfiber cloth and then follow with Jescar Micro Finishing Polish if necessary to bring surface to an ultra high gloss finish. Store in sealed bottle, avoiding freezing or very hot temperatures. Hands down best compound I have ever used. Cuts fast, doesn't dust, wipes off easily and finishes down very far in most paints. After trying this, it will be hard to replace it with anything else. As a reference, I have tried several compounds including ClearCut, HDCut , M105, TLC, 3M, etc. None of them compare. Highly recommended. I use a lot of polishes for my small detailing business and this is now my "bread and butter" polish. It has the cut of Menzerna with the easy of clean up of Meguiars (all of which I use). I like products that work and clean up easy and this does both! Only down side is that it slings a little more than most so be careful-take your time when applying as to not throw product everywhere-instead of dabbing product across panel I rub it into the pad and it helps. Totally buy this again after it runs out. Haven't had the chance to use this on my car. But I have used it on three bathroom quart type counters. All I can say is wow. Used the Surbuf R buffer pads with some rupes polishers.